Ball Grid Array (BGA) assembly is relatively newer, more sophisticated technique which is gradually replacing the Dual-In line-Package technique (DIP) or conventional flat packaging techniques. During the BGA assembly process, it is important to note that the pads are under the package and therefore not visible to the naked eye. Due to this reason, we not only require a quality soldering process but BGA inspection is also required to ensure optimization and reliability. 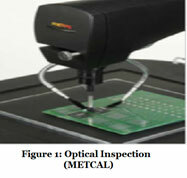 BGA inspection or Surface Mount Technology (SMT) inspection is done to analyse the connections between a chip and a PCB. In BGA, we have to inspect various aspects of the assembly such as the standoff height of the package, keeping a check for popcorning and continuously monitoring the size of terminations. Optical Inspection can be done by closely viewing the Ball Grid Array connections with the surface of the PCB using an endoscope. Equipment for optical inspection is available in the market and these systems give us a clear picture of the connections between PCB and the chip from where we can assess the quality of the process. Mechanical testing of BGA is a destructive process. Mostly destructive mechanical testing is done by shock tests in which the complete assembly is subjected to shock and shear and mechanical properties of the solder joints are then evaluated by measuring strain. The most advanced method of BGA testing is X-ray inspection. With the use of x-rays we can simply get a clearer picture of the process. When the complete PCB is subjected to an x-ray test, the image that is obtained clearly shows the ball grid from where one can visually analyse the connections that cannot be optically inspected. X-ray inspection can also be done in real-time along with the BGA assembly process to continuously monitor the quality and because this also helps us inspect the joints which cannot be analysed by conventional techniques, this is by far, a better choice. Another problem which is very commonly encountered is the “Popcorning” of BGA connections. When the deformations of the BGA increase, it causes certain balls to merge together during the soldering process causing “Popcorning” of the assembly as shown in figure 3. When X-ray inspection is done, this is very easily found out. It is important to note here that this effect might not be easily inspected through optical inspection because the popcorning of connections might be in the center of the package and hence invisible from sides. Therefore, the X-ray inspection adds a much valued advantage to the BGA assembly process. How is a PCB designed? How do radars detect an object's speed?